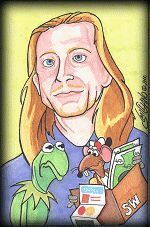 From the suburbs of Atlanta to the upper tier of Muppet performers, Steve Whitmire has come a long way, and in this interview conducted on the set of Muppets From Space, no stone, or lily pad, is left unturned. Well, lets begin at the beginning. Youre from Atlanta, right? WHITMIRE: I was born and raised in the suburbs of Atlanta. I got interested in puppetry when I was about 10 years old, even though Id seen the Muppets all my life, but that was the year that Sesame Street started. I was a real fanatic about the show. I actually watched it twice a day. It was on in the morning and in the afternoon, and I would tape record the bits on my little cassette tape machine and lip sync to them with puppets that I started trying to build. The first puppet I ever tried to build was Kermit, and I didnt know anything about building puppets, and I built him out of an aluminum potpie container. It was like the shape of the top of the head, and I put a cardboard mouth with staples around the edge of the pie thing and I painted it green, but it worked. It was awful, but it was a start. Then, I actually wrote a letter to Jim Henson around that time and I asked him if he had ever done any books on puppet making, because I was really interested in making my own puppets. And he wrote back, which was a huge thing for me as an eleven year-old kid, to get this letter from Jim Henson, who was my idol. He said he hadnt written any books on puppet making, but he encouraged me to keep doing it. Apparently, Jane Henson had published some patterns for puppets in a Womens Day magazine several years before that, like back in the early, early 60s. It was this basic "Anything Muppet" pattern. I wrote to Womens Day and got their last back issue, and that was my start making puppets, with these Muppet patterns. I would add an inch here, change an inch there and change the shapes, and that was how I really started building puppets. So I did puppetry all through high school as a hobby. Every time I would have to do an oral report in school, I would do it with puppets and get a good grade. All my friends wanted to be a part of my group because they got to do a puppet and they always got a good grade. I guess when I was about 17  I graduated high school right around that time  I went to work for Sid and Marty Krofft at this place called "The World of Sid & Marty Krofft" in the Omni, which was the first indoor theme park. I was doing one of my own characters, named Otis, who was a beach bum kind of bearded, barefoot character that I built. My job was to walk around the theme park every day and talk to kids. No ventriloquism or anything, I just talked to the children. A better puppet than the pie tins, but a Kermit puppet that I had built. I remember them saying; "You cant use Kermit in the theme park." Which I knew, so I used the character of mine. So that lasted for six months until the park closed. During that time, a man named Don Kennedy, who was into all sorts of television and radio in Atlanta, had started Channel 36, a UHF station there. It had a very cable-access kind of a feel to it. WHITMIRE: Yes, very much so. We were in an office on the 8th story of an office building, and we had eight-foot ceilings. The monitor was mounted on the ceiling, and I would lay flat on my back and do the puppet. I filled two-and-a-half hours a day doing this by taking phone calls from children in the area who were watching the show. I loved doing it. What kind of cartoons would you show? That was probably the best stuff that we ran. The rest of it was just terrible. I dont even remember it. It was stuff that no one even heard of. It was whatever they could get for no money. We would show that stuff for 15 minutes every so often, but most of what we did was just talk. It was a talk show with puppets for children, although the adults called in as well, but mostly for kids. Was it just the puppet in the studio, or would there be some interaction? WHITMIRE: It was my puppet and I did this for a week and thought, "I really need some help," so I got Don to hire my best friend Gary Koepke. Wed gone to high school together. So Gary did 3 or 4 other characters that centered around Otis, very much like Kermit and how all the other characters centered around him. Otis was almost more the straight man than the comedian. We did this show for about six months, at which point Cindy Smith, a girl that I had known at Krofft, who was a local actress, was putting together this shopping mall show. 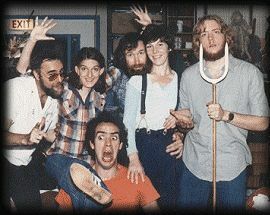 We were going to do an Easter show at one of the local shopping malls, and we were rehearsing at Dekalb Community College, the college that she attended. While we were there, I noticed on one of the bulletin boards that there was this little flyer for the Southeastern Regional Puppetry Festival. I had never heard of these festivals. I guess they had them for years. I decided Id love to go, because on the flyer it said that Carroll Spinney was going to be there. It wasnt to get a job, I was dying to meet someone who worked with the Muppets. These guys were really my heroes. Only three days. I met Carroll and his wife Debbi, and we just sort of hung out over the weekend and we exchanged addresses and that sort of thing, but I never really thought that I would hear from him again particularly. None of that. It just happened with no effort. Everything just fell into place with no real effort toward making it happen on my part. Thats the way to do it. WHITMIRE: Its incredible. Its an amazing thing when that happens. Its one of those "meant to be" kind of things that just fall into place. So I called Henson, basically went through the front desk. They said Jim was in London doing The Muppet Show at that point. Turned out that when I called, Jane Henson was going to be flying through Atlanta the next week, because they were building the Kermit the Frog Macys Thanksgiving Day Parade balloon at a Goodyear plant somewhere in Georgia. So, the next week, Jane was going to be in Georgia. Coincidentally enough, you know? So we met at the airport. I took a trunk full of puppets and some local newspaper articles and things like that, and we talked and had dinner together in one of the airport restaurants. If Im not mistaken, I dont know whether it was John and Heather or Brian and Heather who were with her as kids. Might have been Brian. Of course they had grown up with puppets, so they werent impressed with puppets at all. So Im talking to Jane about puppetry and she said, "I really hate to do this in a restaurant, but I really have to see you pull out a puppet and do something." So I took out Otis, this character I had been doing, and the kids at the table behind me, who were local kids and knew the show and had called in before, came over to talk and we talked to them. They loved the show. Jane has told me since then, that was the reason she decided that I should be hired, the interaction with the kids. I sent a tape to her, which she showed to Jim.
" The next thing was going to London and starting on The Muppet Show. Jims "auditioning process" was interesting. When we had talked on the phone, he said, "Right around the first of the year, Im going to be back in New York. Id like to fly you up to New York and youll audition. Id never really been out of Atlanta any further north than Kentucky. So being this naïve little kid, I take my trunk full of puppets and this little lightweight coat, in the middle of January, and 20 dollars, and I get on an airplane and go to New York with Jim paying for the flight. When I get there, it costs me 15 of that 20 dollars to get to the hotel they were putting me in, and they had said well give you some money for expenses once you get here, but all I had until then was $5. It was the coldest winter in New York in like 7 or 8 years at that point. The snow was piled up on the building 6 feet high. It was terrible, and Im wearing a lightweight little coat. So I get to the hotel, and that night I wanted to eat, but I was petrified of New York. I didnt want to go out on the street, so I decided to eat in the hotel restaurant. You had to have a jacket to get in, and I didnt have one, so I think they gave me a jacket to get in, and Im sitting at this little table. All I had the money to order was a shrimp cocktail. It was like $5, and I paid cash, no tip. Thats all I had. I didnt even know you could put food on the room. This is how green I was. I wait a second, think about it, and I push the button again. "BUUUUZZZZ." I still dont do anything. I thought that maybe Id set off an alarm or something. I didnt know what was happening. So I thought about it for another couple of minutes, and then I hit the button the last time, and this time, instead of buzzing, Im standing there as the door flies open toward me and I step back and Jim steps out. This is like 8:30 in the morning. His hairs kind of mussed up and hes got a broom in his hand. He steps out and the sun hits him for the first time and he kind of squints and looks around a little bit perturbed because someones been playing this joke on him. He looks around the back of the door and Im standing there and I go, "Hi!" Typical kid, you know? He said, "Can I help you?" I said, "Yeah, Im Steve Whitmire." And he looks puzzled. He had no idea who that was. Then I said, "The puppeteer from Atlanta." So he said, "Oh yeah, well cmon in." Jim Henson and Junior Gorg stand on the stairs of the New York Henson offices. I go in, and he had been sweeping the stairs of this huge, long staircase that ran up to the offices. Hed spent the night there, having worked late. We were walking upstairs, and at this point I had $1 to my name, a lightweight coat, and a trunk full of puppets. We get to the top of the steps, and he said, "You know, we really werent expecting you quite this early." What I didnt know is that things in there really didnt get going until 10:00-10:30 in the morning. Im trying to be on my best behavior, so I said, "Well, you know, I could go away and come back," while Im praying, "Please, please dont send me away," because Ive got no place to go and no money. He said, "Yeah, thats probably a good idea." So I left my trunk of puppets there and I left. There was a Woolworths up at the corner. I went and sat at their fountain and had a dollar cup of coffee that lasted 3 hours till I went back around 11:00. WHITMIRE: Thats right! Keep your mouth shut. I assume the audition with Jim went well. WHITMIRE: Its funny. Thats why I said "audition" in quotes, because when I got back to the shop, which was just down the street, there was a whole table full of puppets laid out in front of a mirror. Jim put on Big Blue, the big round head guy on Sesame Street, and there was a character called Farley, that I think Jerry Nelson did years ago who was basically an "Anything Muppet" little kid that was laying there. I hoped! But that was what we did. So do you believe that Jim had made up his mind very early in the process to hire you? WHITMIRE: I think so. Id be willing to guess that at that point in time, when the Muppets were at the height of their popularity during the middle of The Muppet Show, that I think he decided it from the video tape, and what confirmed it was our meeting. I dont know that. I just have a feeling about that. WHITMIRE: Well, the whole deal was that he was originally looking for people for Sesame Street and by the end of that couple of days, he said, "I dont think Ill put you on Sesame Street. I think Ill bring you over to London for The Muppet Show. Theres a lot more for you to do there." It was the best thing that could have happened. 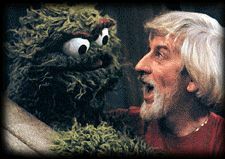 Not that Sesame Street isnt wonderful, but because Jim and Frank were spending so much time on that show, it was the place to learn. It was like going to college. I would never have learned all that I learned from those days and those people had I been on Sesame Street, so it was the best thing that could have happened. WHITMIRE: It was the best opportunity to learn, because whenever we do a series, theres a lot of opportunities to just get a character and to be in the background and if you mess up, its not the end of the world. You have a lot of opportunities to learn. Sesame Street shoots on a very fast pace. You get a couple of takes, three if youre lucky, because theyre moving. Theyre really knockin this out. Youve got to be good in a hurry, so it was really good that I got to go to London. WHITMIRE: It was such a culture shock for a kid from the suburbs of Atlanta. It was like somebody turned the world upside down and I had just dropped into this place. I didnt know a soul. I knew Jim and I knew Frank, but I really didnt "know" them. I was 3,500 miles away from home. I was just petrified. Did they find you an apartment? Maybe 6x10. It was very small. You can move in the room. So when did you start working? WHITMIRE: I started about the middle of the third season of The Muppet Show. March 24, 1978 was my first day.